Almighty God, we bless thy Name for the life and witness of Robert Hunt, first chaplain to the Jamestown colony, who sought to unite thy people in thy love amid great hardship: Help us, like him, to work for reconciliation wherever we may be placed; through Jesus Christ thy Son, who with thee and the Holy Spirit liveth and reigneth, one God, for ever and ever. Amen. Almighty God, we bless your Name for the life and witness of Robert Hunt, first chaplain to the Jamestown colony, who sought to unite your people in your love amid great hardship: Help us, like him, to work for reconciliation wherever we may be placed; through Jesus Christ your Son, who with you and the Holy Spirit lives and reigns, one God, for ever and ever. Amen. Robert Hunt (c. 1568 - 1608), a vicar in the Church of England, was chaplain of the expedition that founded, in 1607, the first successful English colony in the New World, at Jamestown, Virginia. He served two parishes in England, leaving each under a cloud, and then was "recruited" by Richard Bancroft (the Archbishop of Canterbury) as chaplain for the newest expedition to the New World by the London Virginia Company. On April 26, 1607, after an unusually long voyage of 144 days, the 3 ships and 105 men and boys made landfall at the southern edge of the mouth of the Chesapeake Bay. They named the location Cape Henry, in honour of the young Henry Frederick, Prince of Wales, eldest son of their king. There, Hunt led what was likely the first protestant sermon in America since Sir Francis Drake's landfall at California in 1579, planting a cross at the site. Within a few weeks, the settlers chose a permanent inland site for their colony on the James River, naming it Jamestown in honor of King James I. The location was selected as being a strategic defensive position against possible attacks by ships of competing European factions. However,this came at a terrible price, as Jamestown Island combined swampy and mosquito-infested land, offering poor hunting and little room for farming with brackish tidal river water and no fresh water springs. While conflicts with the other Europeans never became a problem, getting along with the Native Americans, and even more importantly, with each other almost immediately became major issues for the ill-prepared colonists. Despite the incredibly onerous circumstances of the Jamestown mission's beginnings, Rev. Hunt seemed to rise to the occasion, often mediating disputes between the camp's various factions, smoothing "ruffled feathers" and making peace. He was described by Edward Wingfield (first president of the Jamestown Governing Council) as “a man not in any way to be touched with the rebellious humours of a popish spirit, nor blemished with the least suspicion of a factious schismatic, whereof I had a special care”. 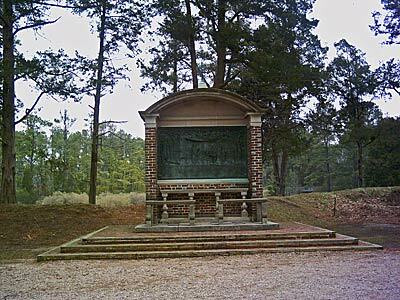 Today, a shrine sits on the site at the National Park Service's Historic Jamestowne attraction on Jamestown Island. The shrine replicates the outdoor chapel conditions under which he spiritually led the men and boys, most of whom were to die, as did Chaplain Hunt, during the first year.